Three Houses banners starting in July, got it. Can't wait to get spoiled on the ending by Heroes before it's even out. And is it just me or are they already building a Sothis mythic hero...? I mean, yes, she's obviously filling the Naga role. I'm worried that the big gameplay gimmick is essentially making your own units. Like this character and their look/personality, but they're a dumb ol' archer? No worries, train them to be the general your team needs instead. And give them a bit of magic in case they need a ranged attack for kicks. The utter choice paralysis that will accompany that system terrifies me. Don't worry, I'm sure each character will have a few exclusive skills for whatever class they end up using. Big disappointment for me with the find and vote results. Blue and Gray were foregone and are fine, but red and green could have been so much better. I really wanted Tibarn, but I accepted a red legendary would probably win, like Marth or Hrid. HMyrrh?? No thanks. Not interested in her or her fodder. Green is the one that really stings though. Legendary Hector should have been a slam dunk, but it appears more people were voting based on what character they liked than what unit. Even vanguard Ike was really high. Yeah, I was really expecting an all-star banner and had managed to save up a decent chunk of orbs for it. But I already have H!Myrrh, L!Azura, AND a bad IV L!Lyn as it is, and their inheritance fodder isn't even particularly exciting. I voted for L!Hector and Nailah myself hoping for solid units that also had some other good skills to pass off, but oh well. Yeah, what, Legendary Lyn? Seemingly widely seen as one of the most underwhelming legendary units? I guess people really want speed tactic fodder...but distant counter and vengeful were right there. Azura is a slam dunk, at least. Good luck to everyone who doesn't have her for that 25% shot. I desperately want half of these units... so naturally I'm going to get L. Lyn. Actually L-Lyn might not be a bad investment. Wind Legend, eligible for Green Duel Infantry... Boring? Yes, but... practical. I was so worried Legendary Azura was going to distract me from Halloween Myrrh on the Legendary Banner. But two birds with one stone! Without the terrible Legendary Banner odds, even! I'm just sitting here yearning for the Tibarn, Nailah, Legend Hector, Xmas Eirika banner that lives on in my heart. She's very last of the four that I'd like to get, but y'all and pretty much the entire playerbase sleeps on L! Lyn really hard. She's a little awkward to use, and not walking powercreep incarnate, but she's actually quite, quite good. Give her a chance. People tied to the Fire Emblem? People who possessed/used the Fire Emblem. In that case, L'Arachel is completely off-theme. She uses a non-Fire Emblem macguffin. Side note, was able to do another merge last night... Sooooo close! It has been far too long since I've talked about Sothe in this thread. I've been running him as a Fury/ Desperation / double Savage Blow player phase unit for a while now, but I've always thought his mixed bulk was extremely overlooked if you didn't go the basic L&D route with him. I wanted to build out an anchor unit for Aether Raids that could bait all the Veronicas and danced mages just to get the party started, but who could also maintain a strong offensive presence and give the rest of my group support. Eir kinda fits the bill, but the flier status and poor Defense made her a little unreliable. So here's what I ended up with. 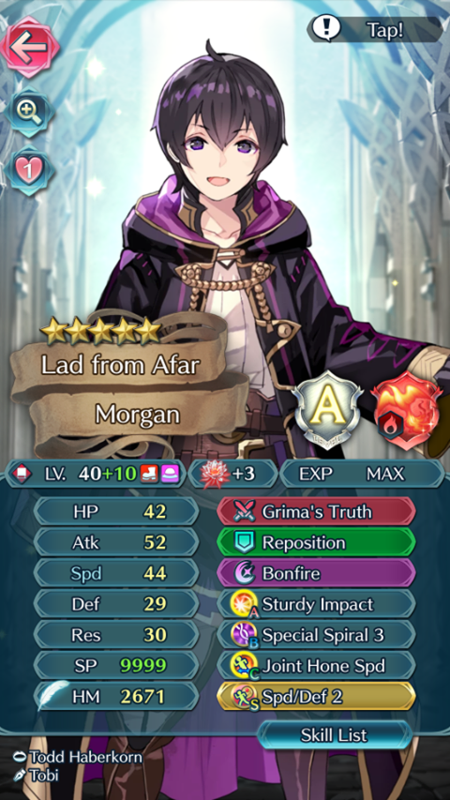 Plop him adjacent to Morgan, and then within two spaces of two additional allies - hard not to do in the cramped first few turns of Aether Raids - and he's getting +14 Def and Res against incoming ranged attacks. And that's just in-combat, feel free to tack on +6 Def/Res if I can manage to get him some buffs. And he leaves enemies with the Def/Res debuff from the boot. Oh, and he's constantly healing and brings Infantry Pulse to Morgan and Ishtar, who I also tend to run. 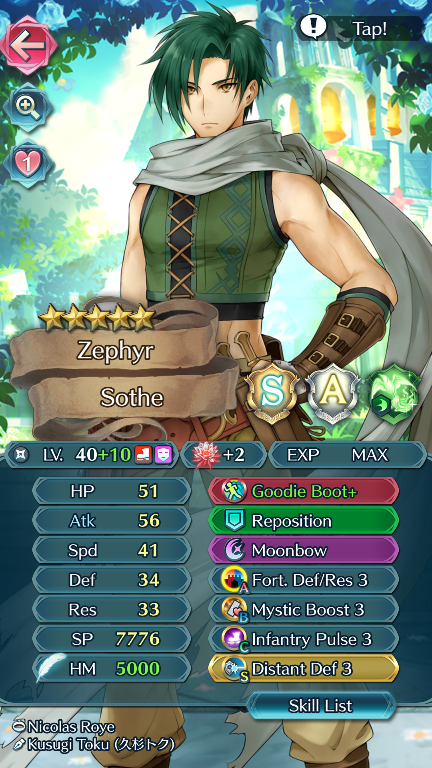 I know most units can be made viable with enough investment, but Sothe here is just really something else. I look forward to making use of him on my Rival Domains teams His old build wrecked face, but this is going to be filthy. More likely that people be lazy and just hit the first character they could, since the bonus game required scrolling and I doubt 100% of those votes were single votes. The obvious solution is to randomize the character placement, something I was surprised wasn't already happening. Soliciting opinions on Myrrh: I have a +7 +RES copy (pictured without summoner support), as well as a +ATK and a +DEF version. Which IV should I pick? 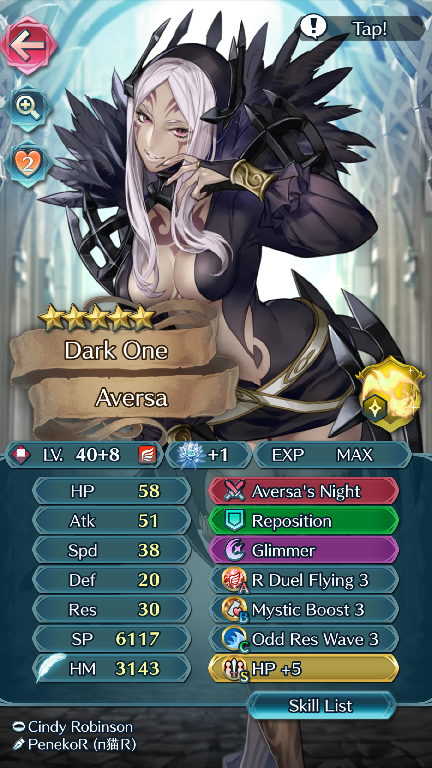 RES currently gives her nice even 40/40 defenses (38 without support), and her attack is pretty decent. +DEF would help her weapon effect preventing doubles, but at this point there's not a lot of units with both the defense and the speed to double her, and most of the units that do have sufficient defense are armors who are forcing doubles some other way. Also she's been running Def Ploy for awhile anyway. +ATK is always good, but magic bulk might be better? Panne at the end. Who was it that was constantly waiting for Selkie? @Talith? And man these weapon effects, they go on forever. Interesting that they're now offering abilities that boost support partners. Stacking Kitsune Fang on top of the self-Sieglinde buff would certainly make my friend's +10 DC Eirika even nastier. Weren't we supposed to get a Binding Blade banner this month? Holy crap Selkie's just loaded for cracking low res units open. Three units with only two passive skills. I doubt they'll give us Special Spiral at 4-star... But it'd be nice if they went back to demoting two units at a time. Especially since beast units are so new and we could use some more variety. I'm a little tempted with this banner...maybe I'll spare just a few orbs to try for Selkie. WAIT A MINUTE THE FOXES ARE CAVALRY UNITS!? 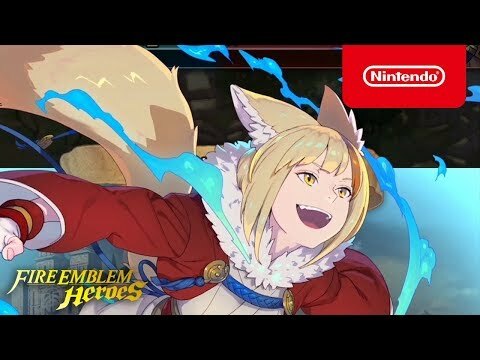 EDIT: Knowing she can get cavalry buffs makes me kind of want Selkie. But I have to stay strong. 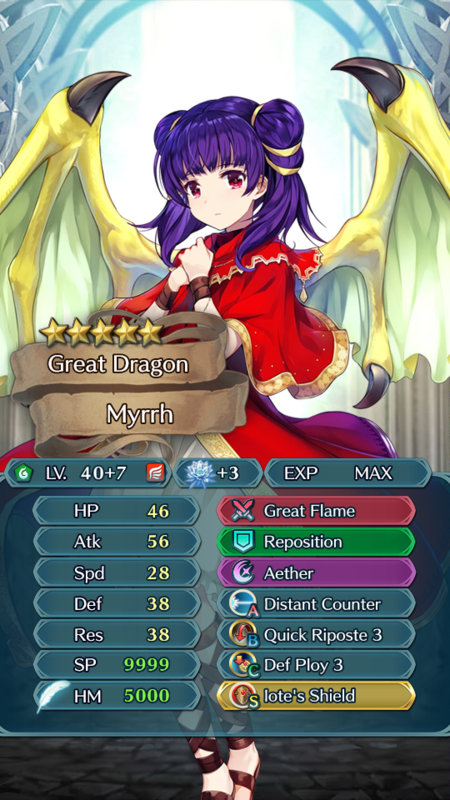 For Myrrh! And Azura! And Ike! And Ike! And Myrrh! Yeah they're never that generous I assume Velouria and Keaton, though she has Close Defense so who knows, maybe just Keaton. Demoting Kaden would put a Link skill in the 4-star pool, but the bloom's been coming off the rose for awhile there. Titania just gave us Atk/Res, and Spd/Res is even less exciting. Goad Beasts is more of a draw than Ward, currently, which puts a point in the "5-star only" column. And then there's his weapon, which is pretty strong but seems fairly safe for the 4-star pool. Although that post-transformation effect seems potent. And he is a cavalry unit... Still, I can't help but feel like I'd be disappointed if he was a 5-star. Like, I'm supposed to feel excited to get someone as rare as this guy? Velouria has Close Defense, which has been available on Joshua for awhile. And Ward Beasts is less alluring for the generally offense-focused laguz we have already. And I don't think I need to mention Luna. But her weapon is what might make her too over-the-top to be a 4-star. A free double Quickened Pulse for her and a friend of your choice? That might be too disgusting to make widely available. The mind reels at the possibilities... I'm kind of excited. But it's also a Wo Dao when she's in Wolf form? Something that strong might make IS keep to their trend of keeping the waifu locked at 5-star once again. What I want to happen, and I think there's a pretty good chance of this, is that since we just got Reyson in green, Velouria will get the nod. And I think Panne will be cavalry, since rabbits are fast and small, which would translate well to cavalry's extra MOV for a small stat penalty. So our 4-star/GHB beast unit pool would be: an attack-focused flier (Naesala), a support flier (Reyson), a cavalry beast (Panne), and an infantry beast (Velouria). That would still leave us without a red unit but it would give us the full variety of laguz at both 4-star and 5-star levels. But hey, I've been wrong in the past. Close Defense is not so nutty these days that it's off limits for demotes, IMO. Velouria strikes me as the likeliest demotion. 1000 orbs. This is when the credits are supposed to roll, right? No that happens when you click "Delete save." Also this cavalry thing opens a can of worms. A small and speedy dragon? That could be a cavalry unit? A kitsune who's also a dancer? Game over, man, game over. Luckily we don't have any canon ones, yet (I've got my eye on you, Househousehouse), but maybe next chapter Alphonse and the gang stumble upon an unexplored region of Hel inhabited by beast units. Also, this definitely means Caineghis is an armored unit, right? You think that's impressive? Well I've got 198 orbs. One hundred ninety-eight! That's right, almost two hundred! You'll probably end up with more Selkies than I do if you spend them all. Also wish I had a Flora so I can give her ATK/RES solo. I actually think the fur-hulk transformation looks a lot better than it did in it's base game. Keaton looks like he'd be a fun unit to use. Beast swordhardt. Well, I'm gonna try and get Velouria and Kaden because of their C skills for my beast team, plus Selkie and another copy of Velouria. isn't a boon in anything better than neutral for any +1 merge?